Tumblr RSS Widget is a web page able to read feeds from Tumblr blog and ready to be included in your web page. 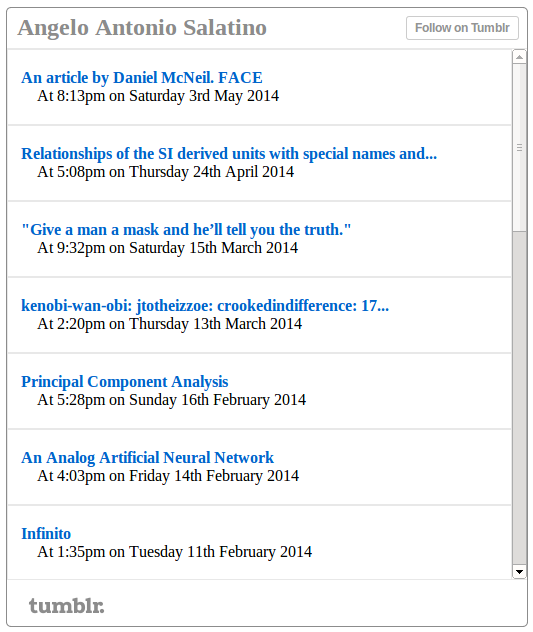 It exploits RSS feeds generated by Tumblr, then it parses and reorganizes them in order to improve the reading. N.B. In version 1.1 the code has been modified for responsive web. In order to do a correct use of this widget, the inclusion with <iframe> is not recommended, it might not work properly. This little project consists of two pages: rsstumblr.php and styles.css. The first file is the core page because it contains all the code that reorganize rss feeds. The second file is a stylesheet file. To customize this widget in order to work for you blog, only the variable $blogname of rsstumblr.php must be set. For example, in my case http://aas88.tumblr.com the variable $blogname is set to “aas88”. On this page there is an example of this widget. Moreover, also the stylesheet file could be modified to choose some desired colors and change other settings. I want to thank whoever wants to use this widget, give suggestions, make it bigger and better.